My heart was longing to pick up the brush again. True, I had a few electives to fill in order to graduate–And yes, an art class could serve to fill one of my remaining electives. But deep down, I didn't know what to do. My heart seemed to cry out, “try again,” while my mind cried quite the opposite. My mind was wondering how my heart could even entertain the thought of walking back in an art department again. Especially, when such darkness had met me in my past art experience. My mind was reeling. If I decided to take art again, would I be able to endure more pain and disappointment from it all? And moreover, if I took art again, would I be consciously exposing my heart to the darkness I’d been fighting so hard to forget? So, being in a state of indecision (yet again), I chose to take a physical education “walking” class. Yeah, that’s right–all I had to do was show up and walk! Great, right? From a place of pain and disappointment, I had learned to ignore my heart’s desire to create. In essence, I had not only learned to ignore it, but I had also trained myself to silence the yearning. I had trained my mind to push aside thoughts about painting and creating, in order to focus on other things instead. Though my heart and hands were grieving I had my mind convinced that artistry was a thing of my past–I had tried it, but it just didn’t work out. Finally, I couldn’t take it anymore. And I did what I had promised myself I would never do. I took off across the campus, headed straight toward the visual arts building. My mind raced. What was I doing? It was like my heart had decided to take over my body–carrying me to the very place I didn’t think I really wanted to go! The beauty of the brilliant light drew my creative spirit forward. Quietly I stepped into the main foyer–suddenly aware my eyes were very hungry to see the beauty of the art and sculptures housed within the space before me. I walked, and I looked, and I wept. I was undone–undone to feel His tangible Presence so near–undone to be surrounded now, not by darkness, but by beauty and light. My soul was hungry for beauty and my eyes hungry for light. There was light and beauty to behold as I gazed at the rich colors and tones of the artwork around me. Lines and textures filled my eyes. Quiet beauty could be seen all around me. And my artisan soul could breathe deep again. I walked and walked, feasting on the artistry and solitude the gallery offered. My whole being quietly processing–processing with God, both the past and the future. It felt as if a huge piece of my soul had suddenly been silenced. My heart was suffering. I was mourning the loss of something that had once brought such beauty and depth to my life. Grief and hopelessness made themselves known to me on a daily basis. Eventually, I slipped into survival mode; choosing to focus my time, thoughts, and energy on an entirely different career path. By staying busy, l believed I could keep my mind occupied–And my heart numb to the pain of the past. Now, I understand the gift of artistry was woven deep into my soul by the Master Himself; however, I didn’t recognize this truth until I chose to walk away from it. I remember seeing the campus for the first time and admiring the architecture of the university’s original limestone buildings. Even though the buildings had been there for many years, they stood tall and inviting–restored and well tended. And for reasons I’m still unable to fully express, my heart and soul seemed to hear them calling. Maybe this place could be a new beginning–a fresh start. Perhaps it could even supply some much needed beauty to my heart and soul. I remember standing on campus, my heart still grieving from the past–And looking up at the beautiful buildings. Tall and inviting, the trees stood to host their Creator’s beauty all around me. The wind began to blow as an array of greenery filled my vision–And suddenly I felt a bit of life begin to seep back into my bones…. This week has been a very busy week in the studio! In just a few short weeks I will be speaking and painting for a gathering in La Habra, California. I enjoy warm weather and palm trees so a quick trip to California this time of the year will be a blessing! Then it’s off to Winston Salem, North Carolina to paint and teach at The Breath and The Clay conference. Hopefully there will be bit of warm weather there too! 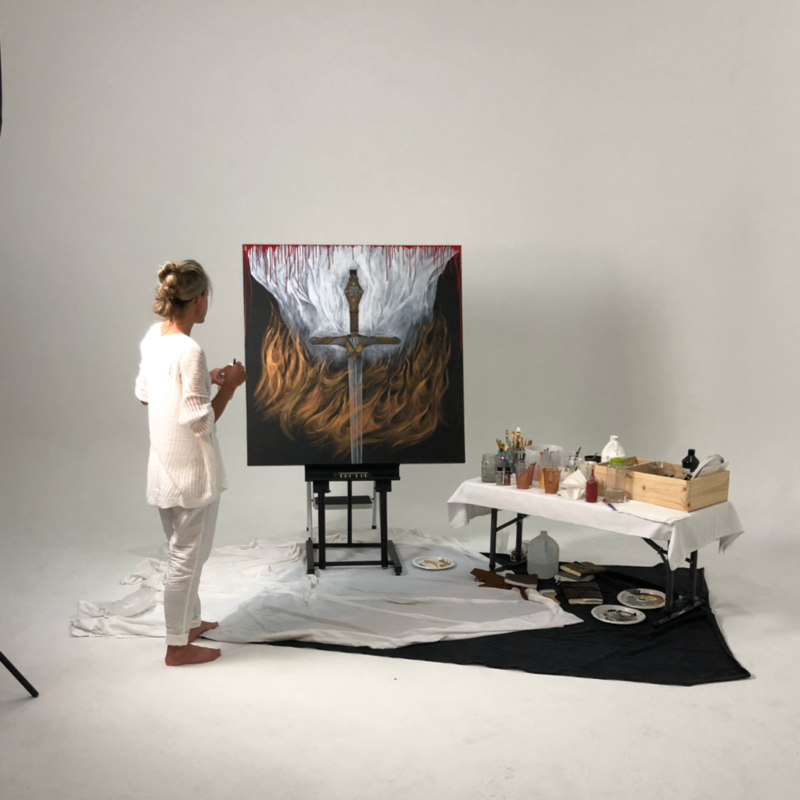 But moving on, today I wanted to answer one of the most common questions I get asked as an artist– How did I get started painting? When I was only three or so, I drew an old pioneer wagon with horses. Looking back, this was probably the first prophetic drawing I ever did! I didn’t know it then, but “pioneering” God-driven creativity has now become a reoccurring theme in my life! Holy restlessness can make a soul a bit stir crazy. So out of the need to do something, I focused this holy restlessness towards honing my artistry. I signed up for all the art classes I could in high school, and spent time drawing and painting outside of school as well. By the time college came, I had honed my artistry enough to receive an art scholarship from a well known and prestigious university. I still didn’t really know what I was to do with my artistic gift, but I figured getting an art degree only made sense. It must be the next step, right? So I went to college on an art scholarship. However, after attending classes for a semester I found myself surrounded by darkness–a darkness that was evident both in the art being produced and the art department I was involved in. Even the creative arts building seemed to host a sense of foreboding darkness. It went against everything in me–to use my artistic gift to create such darkness, depression, pain, hopelessness, emotional anguish, etc. in my work–and promoting the darkness was an unspoken, yet evident requirement in the classes I was taking. I had always wanted to produce images that were life-giving not life-taking. So it was extremely difficult (even painful), to find myself thrust into this very dark creative environment. An environment in which I was expected to create and produce more darkness. Artists are deep souls. We feel deep. We live deep. We love deep. And we really know no other way to be. Deep waters seem to be woven into our very DNA. So when I found myself in a creative environment filled with such darkness, I found and my soul fighting a depth of depression I had never known. I was broken. Disappointment choked my soul. Grief and sorrow overwhelmed me in ways no words could express. I felt as if a part of my soul, deep down inside, now ceased to breathe–what I thought would be, was no longer. All sense of direction and purpose was now silenced by the darkness I had encountered. I continued college, but my artistic spirit existed in a sort of silence and isolation. My heart remained with God, but from a distance. I didn't know what to do next. If I turned my back on art, was I actually turning my back on my true purpose and calling? I didn’t know anymore…and it was too painful to process. So i ignored the painful disappointment, kept myself busy, and threw myself into my new major–working off campus and taking full loads every semester. I wouldn’t pick up a paintbrush again for several years…. More of this backstory coming soon! Want to ask the artist a question? As an artist, I've had numerous people ask me about my creative process–what it looks like on a day to day basis, etc. Until now, we really haven’t had a place for readers and supporters to ask these sort of questions. Now we do! Welcome to my newest blog, Inside The Studio! First, this blog will provide a place for me to (personally) update 2911 The Treasury readers and supporters on any current projects going on in the studio–well before they are announced to the public! Oh yes, to post a question simply click on “Comment” (found above & in grey). Well, it looks like we're off and running! Sign up below to receive a FREE MP3 teaching, news, and updates directly from the artist. Your privacy will be protect and your email will not be shared. Thank you! For signing up to our blog, we have a FREE download of the Anchor of Intimacy teaching for you today. Thank you for blessing us and being a blessing.